Nose: Dark fruits of plum and cherry, a slight spiciness. Palate: Pepper and oak fuse to finish with a toasted bread, nutty and dried fruit flavor. The finish is more citrus and lemony, with a creamy and woody finale. Another fine expression from Comandon’s single cask range. 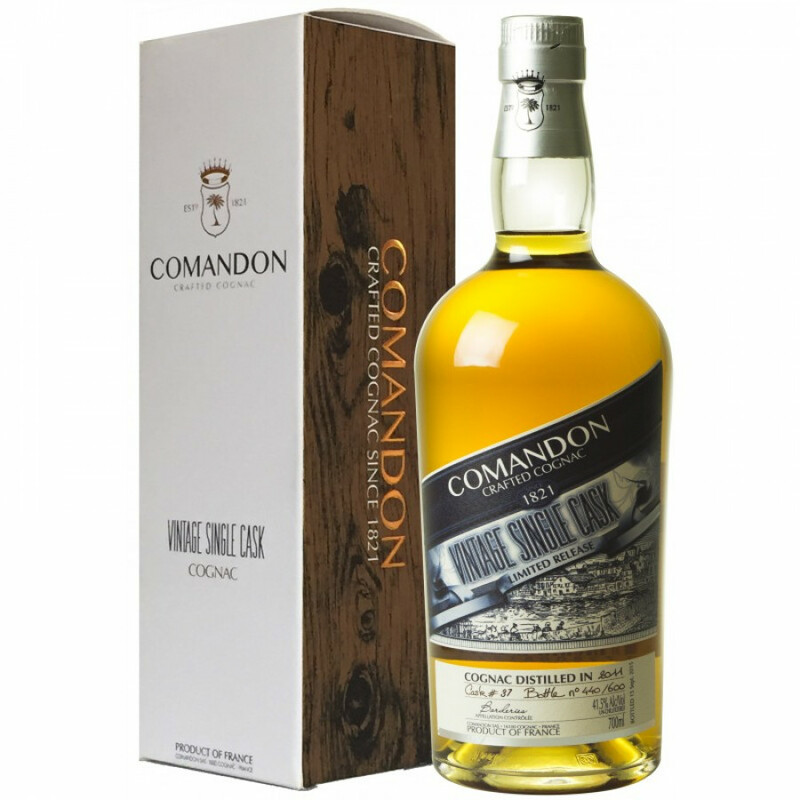 The Comandon Vintage Single Cask 2011 Borderies Cognac captures the essence of the floral subtlety and complex fruitiness that so many desire from an exceptional Borderies Cognac. The Borderies cru is the smallest of all the terroirs at around 12,500 hectares, but is highly sought after. It is the oldest soil of all in the region; millions of years of fossilization dating back to the Jurassic era has created the finest of flavors and aromas in the eaux-de-vie. As a Vintage Cognac, it is a snapshot of one harvest bottled in 2011. This family-run brand age their eaux-de-vie in oak casks from various regions; Limousin, Tronçais, Allier, etc. The casks are lightly toasted, and while the distillate remains the same, often they will be aged in different barrels throughout their life. 223 bottles were made of this rare Borderies Vintage Cognac by Comandon. The Comandon single cask philosophy is quite revolutionary to the Cognac world. In 2010, they decided to create small quantities and single expressions of one year, one cru, instead of trying to mass produce the same Cognac year in, year out. They do not add colorings or flavorings, nor sugar, and generally bottle at cask strength. Enjoy this unique expression neat, to savor its snapshot in aroma and flavor of the Borderies terroir. Comandon is an independent Cognac house that continue to control all of their production in-house. Their philosophy lies in uniting traditional elegance and two centuries of savoir-faire with modernity and pushing the boundaries, which can be seen in their bespoke branding campaigns and unique internet presence. Think La Dolce Vita meets Armani. With an extremely forward-thinking marketing agenda and a particularly hands-on approach when it comes to the music and entertainment industry, Comandon have carved themselves an interesting space for a niche approach to the Cognac business. They do an exceptional job of producing small, artisanal batches that offer rare and limited glimpses into one particular terroir, or one exceptional harvest, whether the eaux-de-vie are younger or older. For this reason, they defy tradition in the Cognac world, who believe that “older is better” and producing the same Cognac year in, year out is the end objective. Comandon instead work in tandem with nature, initiating unique collaborations for their single cask collection, and never fearing experimentation. With a history dating back around 200 years, the Cognac house continue to produce excellent Cognac and receive top-notch awards. Eye: Deep dark reddish amber. Nose: Pastry cream and toasted cookie dough. Grainy, and warm. Palate: Rich fruit cake, and a saltiness that perfectly balances the fruits of the orchard. A long finish, with citrus, orange notes. Eye: Dark mahogany. Nose: Warm pastry creme, sweet toasted grain and cookie dough. Palate: Fruit cake, and a saltiness that perfectly balances the fruits of the orchard. The finish is long with tangerine hints. Eye: Amber gold. Nose: Fruity notes of mango and apple, and the bouquet is a delicate cherry blossom. Palate: Wild honey with ginger and vanilla sweets. The finish is full bodied and rich, like a dessert wine with orange marmalade. Eye: Light golden color. Nose: Clove, spice, rich toffee warmth. Palate: Velvety, orange peel, ginger and ice tea. The palate lingers, with initial spice and a soft peppery taste, apples, leading to a creamy body with a nutty flavor of vanilla. Tasting notes by Hine: First impression : wild cherry wood. Main character : balance. Characteristics : soft spices, lime tree, orange peel.